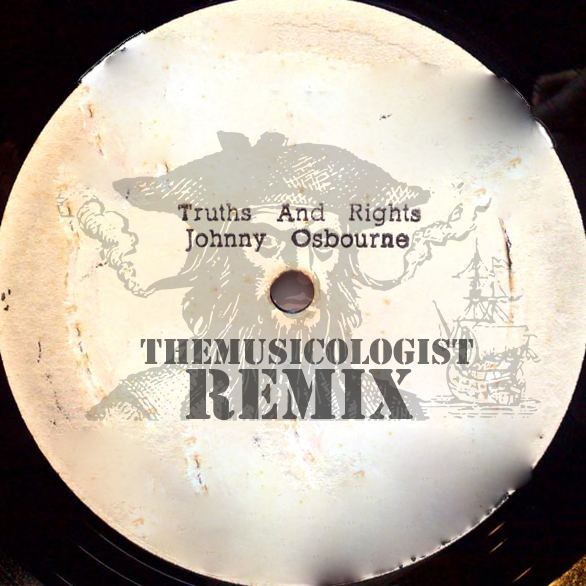 themusicologist is back in the saddle today with a remix of the Johnny Osbourne Downbeat Roots Classic ‘Truth & Rights’. Recorded in the late 70’s at Sir Coxsons Studio 1, although in truth it was, like much of Coxsons later output an overdub recorded over an early 70’s ‘golden age’ Studio 1 rhythm, a practice originated by Sugar Minott a few years earlier. new theme built around the teachings of legendary taoist Yen Tzu who, legend tells, founded a famous academy somewhere in the mountains of an Eastern Province in ancient China around two and a half thousand years ago which led him to become China’s first commercial billionaire. not that this is about money, rather self mastery through individual inner understanding which, for themusicologist is the only ‘way’ to navigate a course through life’s most dangerous waters. ‘In truth it was through having his feet stamped on by the mighty bull while he bravely fought to recapture it’, said their patriach, Yen Tzu, upon overhearing their discourse. ‘the mutual seeking of yin and yang depends on opening and closing.’ Began Yen Tzu. ‘Opening and closing are the natural principles that influence the rise and fall in all of heaven and earth’s ten thousand things, including man and beast. Yin and yang should always be harmonious. for the opposite of one, redresses the balances of the other. ‘When the bull was in yang mode, so was toeless Wong. Rather than adapting yin mode, he fought charge with charge. He pitted his agression against the bulls. When yang is hard and agressive, only the yielding softness of yin can calm it. As a seasoned keeper, Wong knew full well how to calm the bull. But seeing the crashing commotion before him he forgot, and was as a fool rushing in. In doing so he was no different to the bull. ‘Yin and yang modes can be taught to be switched on or off according to what is needed. Yin or yang must be used as appropriate to tame that part within all of us which can be likened to a charging bull, and to soften the raging bull within others who appear to be attacking us. ‘Men’ do not mirror themselves in running water; they can only see themselves in still water. Only what is still, can calm to stillness others. yesterday flew by without a post so today I’m getting this one in early. what is Love? everyone has their own definition I suppose but for themusicologist this 1957 cut from well known singer Johnny Mathis goes a long way to providing an answer. I read/heard somewhere that the music that touches us deeply gives us and others around us, (our ‘Loved’ Ones), an insight into how/who we would like to be in the ideal world, without the chains of our personal experiences that have shaped our lives. I don’t know about that but I do know that I gravitate towards songs about Love partly because It’s an emotion that I find very hard to express, (other than where my children are concerned), This is not because I haven’t received it, (thanks especially to my mum), and maybe therein lies the conundrum..for me the unconditional variety is the only one worthy of the name … but before this post gets too deep let’s return to the music. penultimate day of the alternative soundtrack and it’s almost over. all three have managed to arrive at the cemetery and it’s time for the showdown. A winner takes all gunfight to the death…no prisoners taken. the music is courtesy of virtuoso musician Sidney Bechet, (ably backed by ‘The New Orleans Feetwarmers), whose professional career stretches right back to the birth of ‘Jazz’ in New Orleans during the early 1900’s. Along with ‘Duke’ and ‘Pops’ Bechet is credited with being instrumental, (no pun intended), in the development of the music that we know and love today and a listen to this should give you an indication as to why. Henry Allen, (Trumpet), J.C Higginbotham, (Trombone), James Tolliver, (Piano), Wellman Braud, (Bass) and J.C Heard on drums. penultimate piece of musicology magic from Mr Marriott and friends…can’t believe it’s gone so quick. one of the many things I ‘love’ about the geezahh is his obvious dedication and commitment to communicating using the ‘universal language’. Not only as a vocalist or musician, (could, and did, play most of them), but also as a performer. most people can sing, (some can play instruments), but what seperates the legends from the rest of us is how they deliver…Steve Marriott delivers as good as anyone and deserves to be ranked in the uppermost branches of the musical tree so that the sun can shine on him from morning to night..
hold this piece of 1971 Rock, Rhythm&Blues from one of the great English bands..Humble Pie .. telling it like it is…quality piece of musicology. a Glyn Jones/Humble Pie production..lyrics courtesy of Steve Marriott. couldnt throw down a Steve Marriott tribute without laying down the piece that kick started my appreciation of the brothers vocal and soulful qualities. 2: brings back memories of being 11/12 and 13 years old as a second generation Mod .. ahhhhhh .. music brings back so many memories..
Not suggesting that these qualities are the only, (or even most important), Mod credentials but if you dig deep enough they are, in themusicologist’s opinion ones that are ever present….another vital ingredient would be the love of Soul, Blues, Rhythm & Blues…without this you can’t be Mod !! the aim is still to let the music do the talking and believe me I’m trying but the six/six/six is inspiring themusicologist to ‘nail me colours to the mast‘ ..